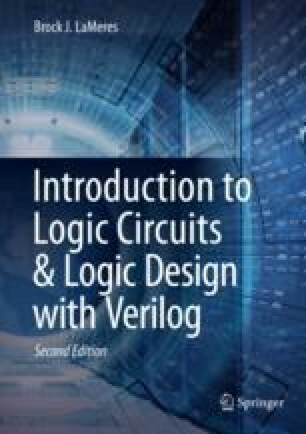 Logic circuits are used to generate and transmit 1’s and 0’s to compute and convey information. This two-valued number system is called binary. As presented earlier, there are many advantages of using a binary system; however, the human brain has been taught to count, label, and measure using the decimal number system. The decimal number system contains ten unique symbols (0 → 9) commonly referred to as the Arabic numerals. Each of these symbols is assigned a relative magnitude to the other symbols. For example, 0 is less than 1, 1 is less than 2, etc. It is often conjectured that the 10-symbol number system that we humans use is due to the availability of our ten fingers (or digits) to visualize counting up to 10. Regardless, our brains are trained to think of the real world in terms of a decimal system. In order to bridge the gap between the way our brains think (decimal) and how we build our computers (binary), we need to understand the basics of number systems. This includes the formal definition of a positional number system and how it can be extended to accommodate any arbitrarily large (or small) value. This also includes how to convert between different number systems that contain different numbers of symbols. In this chapter, we cover 4 different number systems: decimal (10 symbols), binary (2 symbols), octal (8 symbols), and hexadecimal (16 symbols). The study of decimal and binary is obvious as they represent how our brains interpret the physical world (decimal) and how our computers work (binary). Hexadecimal is studied because it is a useful means to represent large sets of binary values using a manageable number of symbols. Octal is rarely used but is studied as an example of how the formalization of the number systems can be applied to all systems regardless of the number of symbols they contain. This chapter will also discuss how to perform basic arithmetic in the binary number system and represent negative numbers. The goal of this chapter is to provide an understanding of the basic principles of binary number systems.